Conflict over finances is one of the most common problems in marriage, and one of the top causes of divorce. People have very strong feelings about money, especially when there isn't enough of it. Psychologically, money can represent safety, self-esteem, social status, security, and the power to control one's destiny. No wonder people are so emotional about it! In practical terms, we need money to get along in life, to pay the rent, feed and clothe our families, have some extra fun now and then, and - we hope - provide some security for the future. If there isn't enough money, we have to make tough decisions. Fighting over how to spend or save is a common problem among couples. Even when partners are in agreement, being short on funds is stressful, and constant stress can undermine even the best of relationships. 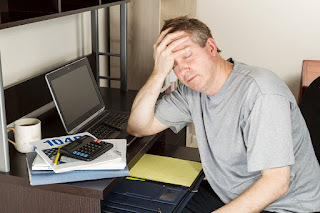 Unfortunately, it seems that most people today are facing some kind of money trouble. The average household is burdened with debts of all kinds. Aside from mortgages, the most common debts are auto loans, student loans, and credit card debt. Even the lower numbers can cause real problems. Take a look at this excerpt from a bill I received earlier this year. My balance that month was a bit over $2,700. Since I pay my bills in full every month, this represents one month's expenses. If I were to make only the minimum payment every month, it would take me 14 years to pay for one month's worth of purchases. Fourteen years! And that assumes that I didn't make any more purchases, ever again, on that credit card! That $2,700 would end up costing me over $5,700, more than twice as much as I originally spent. Suddenly, all that stuff I bought on sale doesn't look like such a good deal. The bank suggests another option. 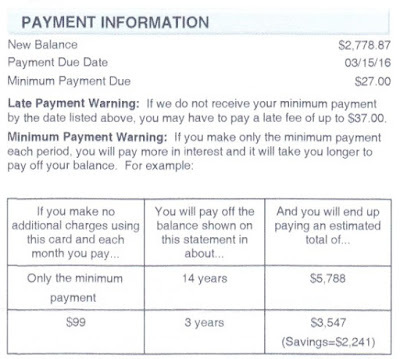 If I pay a higher amount each month, I can get this paid off in three years, for a total cost of $3,500. Note that they frame this as a "savings" of $2,200. This is not saving! This is just losing less. And, once again, these numbers are valid only if I stop using the card. Many, many people are caught in this kind of trap. Somehow they never manage to pay off that debt. Fourteen years later, they are still making those endless payments. So much money that could have gone into a savings account, or a nice vacation. Money that could have bought karate lessons for the kids, a spa weekend for Mom and Dad, or a life-saving operation for Fluffy (who had to be put down instead). Money that could have been donated to a worthy charity, or used to throw a fabulous anniversary party. All that money just thrown away paying interest on long-forgotten purchases. No wonder people are stressed, upset, and angry. No wonder every buying decision turns into an argument. The credit card bill added to all the other monthly expenses can make us feel like we are bleeding to death, with every new expense a stab to the heart. Of course, the best option is not to get into debt in the first place. The next best option is to end the cycle of debt. It will require a higher level of consciousness about spending, coupled with plenty of self-discipline, to break the habits that create and maintain the problem. If the situation is especially bad, or if both spouses can't agree on the best approach, credit counseling can be a great way to come up with a good strategy. Married or single, taking control of your finances and living debt-free is one of the best things you can do for yourself. The Ultimate Guide To Getting Out Of Debt from Forbes Magazine. That's a pretty big bill! How can you afford to pay that much every month? Luckily, my bills aren't the same every month! But this doesn't represent a lot of luxury items and impulse items. Most of it is basic expenses, like health insurance, groceries, car maintenance, and household necessities. I charge most of my normal purchases as a matter of convenience, knowing that I will have to pay for them at the end of the month. I agree with your comments about forgotten purchases. A month or two later nobody remembers all the junk they bought. Better to go minimalist.